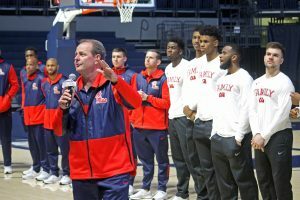 Ole Miss and head basketball coach Kermit Davis have agreed in principle to a new four-year contract extension, according to a release from the university. The extension comes exactly one year after Davis was introduced as the Rebels’ new head coach. Kermit Davis, recently named SEC coach of the year, has successfully led the Rebels into the NCAA tournament. Photo by Kenzie Richmond. Davis was named SEC Coach of the Year in his first season in Oxford and led the Rebels to their first NCAA Tournament bid in four years. The Rebels are 20-12 overall and 10-8 in the SEC. Davis is the third active SEC head coach to win at least 20 games in his or her first season. The timeline for the change of trajectory for Ole Miss basketball has been fast, and expectations have been raised after Davis’s first-year results. Many people close to the program said that, from the very beginning, Davis made it clear that this would not be a rebuilding season. Ole Miss saw one of the biggest turnarounds for a Power Five team in 2019, finishing with a 12-20 overall record and going 5-13 in the SEC after a tumultuous finish to the previous season. Andy Kennedy elected to resign from his position after a loss to Missouri that extended a five-game skid on the tail end of the season last year. However, the writing was on the wall for the winningest coach in Ole Miss history before the season even began, when administration announced Jeffrey Vitter and Ross Bjork declined to extend his contract. The fanbase was initially disgruntled, but the argument from the administration was that Andy Kennedy failed to win consistently on the court and on the recruiting trail toward the end of his tenure. Davis hit the ground running as soon as he was hired, preparing the team for a trip to Canada to play some of the top teams up north. Division I teams are only permitted to take such preseason trips once every few years, and Davis used that favorable timing to install his system and, more importantly, help players recruited by Andy Kennedy’s staff buy into his notoriously demanding team mentality. Davis was able to bring Ole Miss back to the Big Dance for the first time in four years with a comfortable 8 seed, using almost the same roster as last year’s squad. The success in his first season in Oxford, along with the security of a long-term extension, will give Davis immense leverage when he’s sitting down with recruits, which should give Rebel fans confidence for the future as he brings in players to fit his system. The Rebels will face Oklahoma in the first round of the NCAA Tournament on Friday in Columbia, South Carolina.